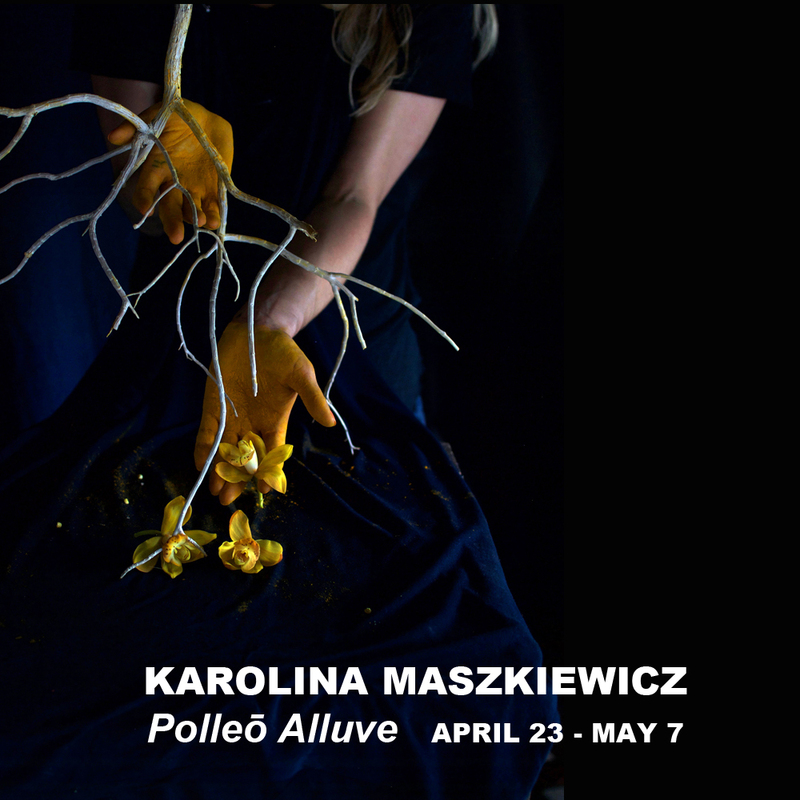 Through May 7, Ochi Projects presents Polleō Alluve, a respiring/inspiring sculptural installation by Karolina Maszkiewicz. It's rare that an exhibition warns you upfront about the live flowers, insects and pollen. But for artist Karolina Maszkiewicz, that's the thesis of her latest exhibition. 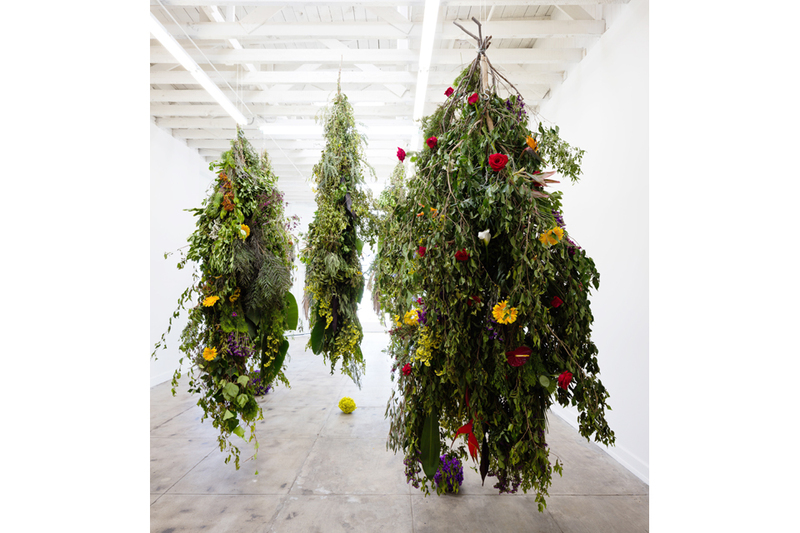 In Polleō Alluve, plants and flowers create an ever-changing experience on the first floor gallery space. 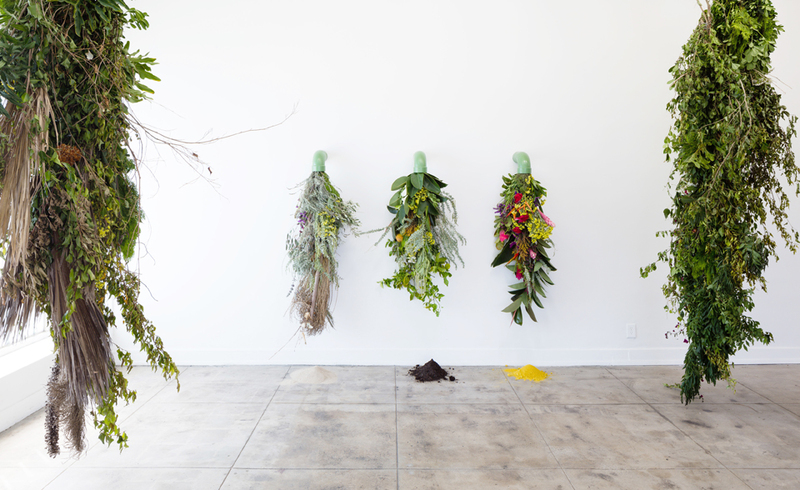 Together, these several installations exceed representation, instead "becoming" an actual garden. Some large-scale sculptures hang from the ceiling. A series of faucets is also mounted on the wall. From here, floral arrangements pour out, hanging upside down and 'dripping' pollen onto conic piles on the floor. Maszkiewicz hopes visitors will enjoy their aromas, colors, and textures, as well as the insects drawn to her creation. 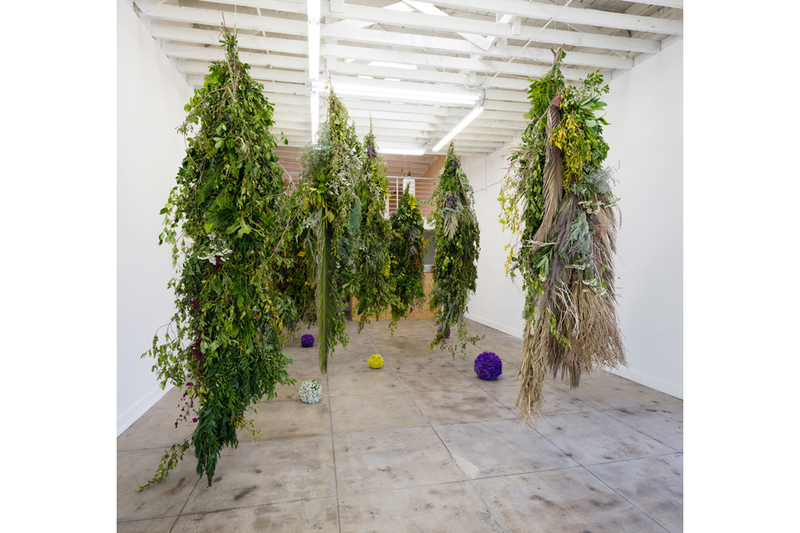 An exhibition statement explains the process: "In a two week period, Maszkiewicz' installations will dry, wilt and die, a kind of microscopic and in-fast-forward analogy to our own life trajectory." Upstairs, the artist shares inorganic works from Divining Rods and Kinetic Sculptures. It's a wonderful complement to the reality of flora found downstairs. Here, representations of man's irrational faith in sustenance are postured, reflecting on our own tendency to purely yearn for that which we believe we need. Something that is at once imaginary, a desire, a want, something seemingly separate from the "natural world" is here in this exhibition, too, in the shape of a "divining rod." Yet this irrational action, to divine water, is also a natural element of our humanity. And, for even the amateur philosopher, it's rather simple to argue that this imaginary gesture is actually derived from our own organic nature.